In November 1926 a professional photographer took this picture of the entire extended Klausner family gathered in the living room of Sam and Minnie's new home on Phillips Avenue in Glenville. Their nine children, spouses and grandchildren had assembled for Thanksgiving dinner. It may have been Sam and Minnie's first year in Glenville. 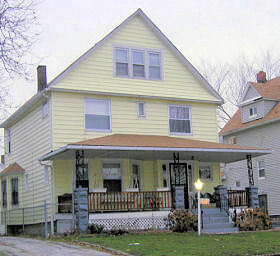 Ten years later they would leave this house for Cleveland Heights. This photo shows 27 people of the Klausner heritage. Abe Klausner, 5th son; Issie Klotzman, husband of Mary Klotzman; Ben Klausner, 3rd son, holding infant twin daughter; Rae Linetsky, daughter of Beryl; Rose Shpeen Linetzky, wife of Beryl; Beryl Linetzky, oldest son of Minnie (before marriage to Sam); Nathan Klausner, (Sam's first child); Jacob Klausner, the 4th son; Harry Klausner, youngest son. Rose Klausner, youngest child (9th); Mary Klausner Klotzman, oldest daughter (born after Ben); Dora Stevens Klausner, wife of Ben, holding infant twin daughter; Minnie Klausner, mother of nine children; Robert (little Bob, son of Ben); Sam Klausner, father of eight of the children; Mary Weisberg Klausner, wife of Nathan; Kate Kohn Klausner, wife of Jacob; Sarah Klausner, 2nd daughter, born after Mary Klotzman. 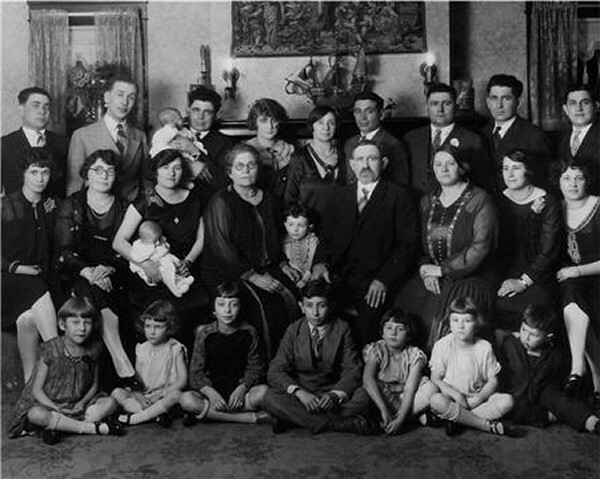 Betty Klotzman, older daughter of Mary and Issie Klotzman; Ruth Klotzman, younger daughter of Mary and Issie Klotzman; Lillian Linetzky, daughter of Beryl; Harry Linetzky, son of Beryl; Beatrice Klausner, oldest daughter of Nathan; Irene Klausner, daughter of Jake; Robert (big Bob), son of Jacob. Eleven grandchildren are shown here. There would be 16 more for a total of 27. Continue to a page on Klausner Cooperage.